Ann Charters has an acute sense of which stories work most effectively in the classroom and knows that writers, not editors, have the most interesting and useful things to say about the making and the meaning of fiction. Instructors look forward to every new edition of her bestselling anthology to see what stories her constant search for new fiction and neglected classics will turn up. To complement the stories, Charters includes her signature innovation: an array of the writers’ own commentaries on the craft and traditions of fiction. The six Casebooks provide in-depth, illustrated studies of particular writers or genres, for unparalleled opportunities for discussion and writing. 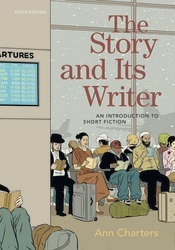 The new, trimmer, tenth edition features many very recent stories and commentaries by up-and-coming writers; a new Casebook on short shorts or flash fiction; and an expanded focus on why we read, study, and write about short fiction. "I still consider The Story and Its Writer unrivaled on the market for the largest, most diverse, and most judiciously chosen collection of works. The concise biographical introductions help to set up useful contexts for understanding the works, and the supplementary material at the end introduces students to critical lenses through which to view the stories afresh."